Game day two in the Western Conference semi-finals brought a pair of contrasting games. The Moscow derby could not have been tighter, with Vladimir Bryukvin getting the only goal for Dynamo in the first minute of overtime. 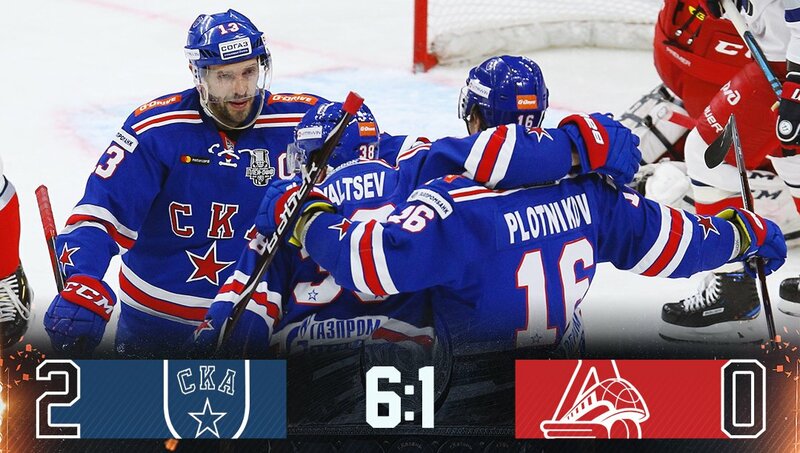 SKA, meanwhile, allowed its offense to let rip against Loko and powered to a 6-1 win. An explosion in the second period of this game saw SKA’s offense finally step up a gear and lead the team to its first comfortable victory of post season. Three unanswered goals took this game away from Lokomotiv and helped the Army Men to a 2-0 lead in the series before the action heads to Yaroslavl on Sunday. Admittedly, SKA got a huge boost when Brandon Kozun was ejected from the game for kneeing midway through the second period with Lokomotiv down 1-2. The Petersburg power play has been impressive throughout these playoffs and the team delivered twice on this major penalty to take a firm grip on the game. Before all that, youngster Mikhail Maltsev scored his first KHL playoff goal. The 21-year-old continues to impress in his rookie season, potting his first post-season effort in the opening frame to give the Petersburg team a 1-0 lead. He picked up a loose puck in center ice and flew down the left channel before firing past Alexander Salak from a tight angle. Salak, up against one of his former clubs, was not destined for a happy evening, even though Lokomotiv found a quick response to that opener when Artur Kayumov’s power play goal tied the game and got the Railwaymen on the scoresheet for the first time in the series. Nineteen seconds into the second period SKA was close to regaining the lead. Datsyuk outwitted two opponents and fed Sergei Plotnikov for a shot at the far post. Nikita Gusev attempted to steer the puck into the net and Salak, falling, got his glove on it as he slid backwards int o the net. A prolonged video review eventually concluded that the puck had not crossed the line and Lokomotiv was reprieved. However, the Railwaymen failed to make the most of it: a 5-on-3 power play shortly afterwards made little impact on SKA’s defense and once the teams were back to full strength the home side regained the lead. This time Gusev did find the net, gobbling up a ricochet after Dinar Khafizullin’s point shot. Then came Kozun’s indiscretion and SKA turned the screw. Alexei Byvaltsev made it 3-1 with his first playoff goal. The former Amur man marked his post-season debut for SKA by firing home a Plotnikov pass as Salak struggled to get into position. Another goal arrived just 39 seconds later, bringing Salak’s evening to an end. The goalie gave up a big rebound from Alexander Barabanov’s shot and Jarno Koskiranta was on hand to bury the puck. Loko appealed in vain for a foul from Barabanov but the officials were unmoved. Incoming Loko goalie Ilya Konovalov held out for 10 minutes before he too was beaten by SKA’s power play. This time it took 11 seconds for the home team to convert its advantage. Gusev and Plotnikov described triangles around the zone before presenting Datsyuk with a chance in front of the net to make it 5-1. Viktor Tikhonov added a sixth – Maltsev among the assists – as SKA romped to an imposing victory and one that could deal a terminal blow to Lokomotiv’s chances of contesting the series. It was an even game until that major penalty. We were in the game and it was good to watch. Then the penalty started and the team fell apart. We made a couple of errors on the penalty kill and it just snowballed out of control. SKA got a boost after scoring the goals and finished the game on a high; we couldn’t do anything about it. Kozun’s penalty is just one of those things, unfortunately. It’s very disappointing to take a major penalty when you’re in their zone. Against a team like SKA you can’t afford things like that. We scored on SKA in regulation for the first time in six games this season. That’s a big step forward. We’ll need to score more goals in Yaroslavl. It was a good game from our point of view. I especially like our attitude and our special teams were great. Why did you rest Hersley, Kuzmenko and Prokhorkin? Because that’s what we decided to do. At the end, the scoreline enabled us to give Pasha [Datsyuk] a rest. [Ivan] Morozov is a good young player, we’re bringing him along like we try to do with all the youngsters. A Vladimir Bryukvin goal in the first minute of overtime finally separated these Moscow rivals in a cagey game two. The Dynamo forward pounced after the 35 seconds of the extras to square the series before the action moves across town to the Blue-and-Whites’ new arena on Sunday. It was a goal from the first and only shot of overtime, following three periods without a goal at either end. Bryukvin fired the puck down the left channel looking for a dump-and-chase, but it got tangled in Nikita Nesterov’s skates and squirted back to the Dynamo forward. He regained control, cut into the center and delivered a wrister from between the hash marks to beat Sorokin. CSKA challenged the call, claiming overtime, but a video review saw no problem with the play and the Army Men suffered their first loss in this year’s playoffs. The first period was an exercise in caution. Dynamo, alerted to CSKA’s offensive power in Wednesday’s 1-4 loss, worked hard to block up the ice and deny the Army Men the space to seriously test Ivan Bocharov. The tactic was successful, at least up to a point. CSKA managed just three shots at the visiting goalie. However, the visiting offense was also almost silent with just five efforts for Ilya Sorokin to deal with. Early in the second period the host thought it had broken the deadlock. Sergei Andronov and Pavel Karnaukhov stormed forward on an odd-man rush and Karnaukhov was presented with a straightforward chance at the far post. 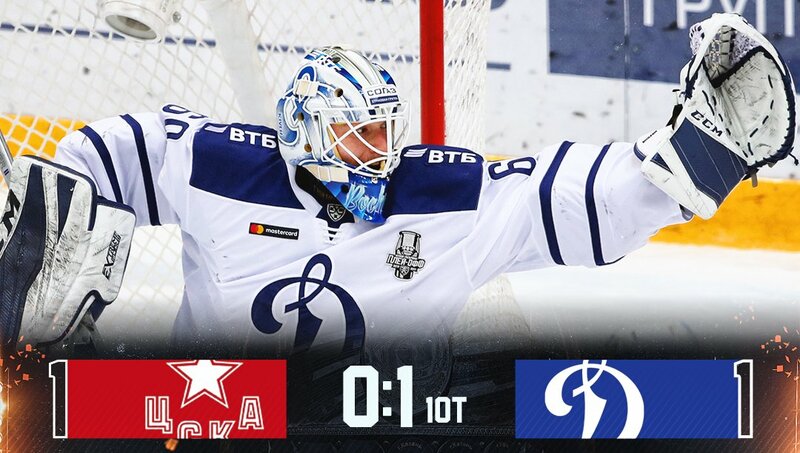 Bocharov had other ideas, though: he spread himself across the crease to pull off a goal-line save even as the CSKA goal horn sounded and the players celebrated. A video review crashed that party and play drifted back into a pattern familiar from the first period, despite the home team’s efforts to pick up the pace. CSKA arguably had another reason to try and force Dynamo to open up. The Army Men selected just six defensemen for this game and there was a danger that as the game progressed, fatigue would start to disrupt the team’s play in its own zone. To some extent, that fear was borne out. Dynamo, while never producing a huge amount of offense, did conjure a couple of troubling moments late on. The best of them came in the last minute when Dmitry Kagarlitsky and Miks Indrasis had a 2-on-1 break. The Latvian had the shooting chance but was unable to convert it and the game went into overtime. Maybe we weren’t on top of our game today and that’s why we couldn’t take the chances that we created. Every game is a lesson, especially in the playoffs. Commitment, self-discipline, teamwork, displaying your skills – there’s nothing new here; all this needs to be improved. I don’t think we were set up quite the same as in the first game. There was some hype around us. The guys are only human, they read the media like everyone else. Today we were taken back down to Earth. It was an even game. Maybe CSKA had more chances, more shots, but we got used to games like that when we played Jokerit. At the end of the game we got the break and scored the winning goal. Well done to [goalie Ivan] Bocharov. He did well, and he earned his good fortune. He’s got long legs, and he needed them for that save from Karnaukhov.